Smartphones have undoubtedly eased our burden of carrying the DSLR camera while on vacations. And the only reason for this is the result which smartphone cameras deliver nowadays. Whether you have to create a bokeh effect or set the aperture, everything can be easily done with a smartphone camera. This means, to capture a pro image you no more need a professional camera. However, the only thing with which smartphones camera are still struggling is, shaky videos. There are several reasons for that. Smartphones lack optical image stabilization feature. All these reasons lead to a shaky or blurry video. Must Read: How to Hide or Unhide Photos on Google Photos. How To Stabilize a Shaky Videos? If you are an Android user then Google Photos app is not a new thing for you. Well! 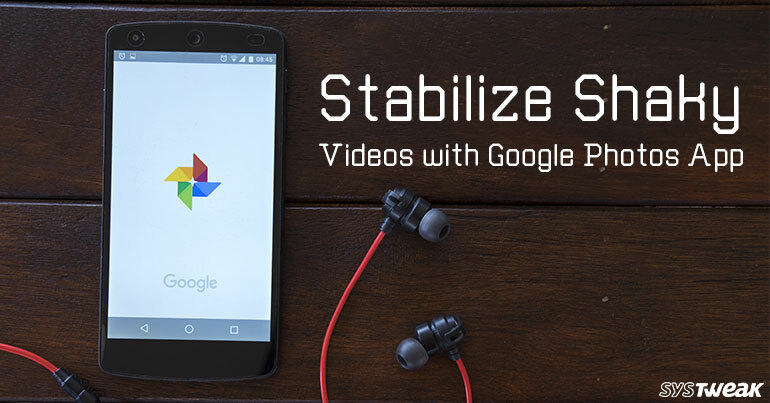 It is Google Photos which helps us stabilize the shaky videos. And what’s more thrilling, you can not only stabilize the videos which you have taken with the device camera but also the ones which are already stored on your phone. Now without further ado, let’s quickly learn to remove the shakiness from the videos using Google Photos app. Since Google Photos app is by default installed on an Android phone you just need to tap on its icon to launch. Now tap on the Albums and select the video which you wish to stabilize. Once you tap on the video, this will start playing on the app. Click on the icon which is next to share icon. This will give you two options, one for rotate and other for stabilize. Since we wish to stabilize the video tap on STABILISE. This will begin the stabilizing process. The stabilization process will take some time, depending on the length and size of the video. That’s all. Now the result you get is a stabilized and shake free video. So, folks a shaky video is no more a headache since it can be easily stabilized by Google Photos app.